The Orlando Regional (formerly the Florida Regional) is excited to celebrate their 20th-year anniversary by celebrating our teams, our students, our volunteers and our alumni. We are looking for our Orlando Regional Stellar Alumni, the ones who are the shooting stars in our FIRST® galaxy. Do you know an alumnus or alumna who has climbed the corporate ladder, is making an impact on their community, the country or even the world? They are solving problems, looking to the stars or teaching the next generation the importance of STEM. Professional Success: Has this Stellar Alumnus/Alumna excelled in their career or in their research? Community Involvement: Does this Stellar Alumnus/Alumna give back to their community through volunteering or philanthropic activities? Do they promote STEM to their community? FIRST Involvement: Has this Stellar Alumnus/Alumna continued their involvement with FIRST through mentoring, sponsoring,Regional/Championship Planning, or even at FIRST HQ? If you know a FIRST Alumni who attended the Florida Regional (1999-2011)/Orlando Regional (2012-2017) as a student that you think is a Stellar Alumni, nominate them! You can be their former mentor or teammate, a friend or co-worker, a parent or their second cousin’s, roommate’s dog sitter, or you can nominate yourself. Nominations are due Friday, December 15th, 2017 by 5pm. Selected nominees will be showcased at the 20th Orlando Regional in 2018! Off-Season Events for the 2017-18 Season! Panther Prowl in Melbourne may be held at a later date, and a new off-season event in Jacksonville will be announcing a date soon. As always, ROBOTICON will also include cross-program events for FIRST LEGO League Jr, FIRST LEGO League and FIRST Tech Challenge teams. Please visit ROBOTICON.net and MissionMayhem.org to learn more about each event, and to sign up for either or both off-seasons, and Go Teams! 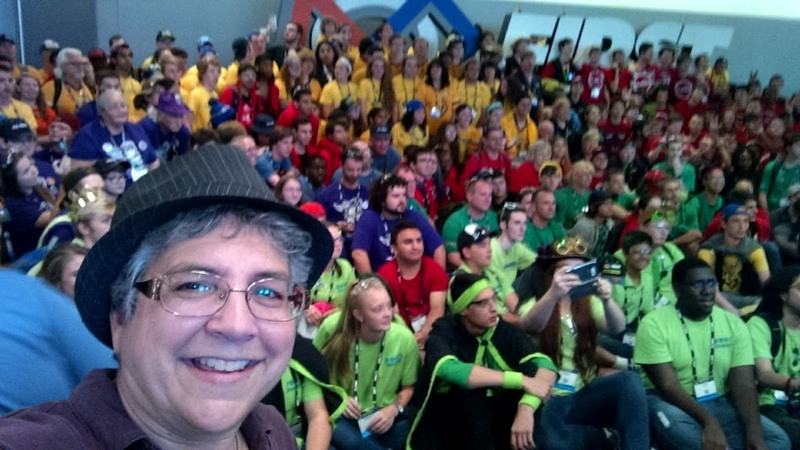 Selfie with a few hundred of my favorite FIRST peeps – Florida FIRST teams at the 2017 Houston Championship. I wrap up my time as Regional Director in Central Florida today, June 30, closing the door on five awesome years of working in an official FIRST capacity with teams, coaches, volunteers and mentors across Central Florida and the state. It’s been a joy, a privilege and an honor and I wanted to send along my best wishes to all of you. Florida has an amazing field crew supporting FIRST programs statewide. That crew includes countless volunteers, FIRST program partners in FIRST LEGO League Jr, FIRST LEGO League and FIRST Tech Challenge, Regional Directors supporting FIRST Robotics Competition and program partners, and frontline AmeriCorps VISTA and FIRST Senior Mentors, who we’re highlighting here today. Allyn Bernstein, serving the South Florida area.